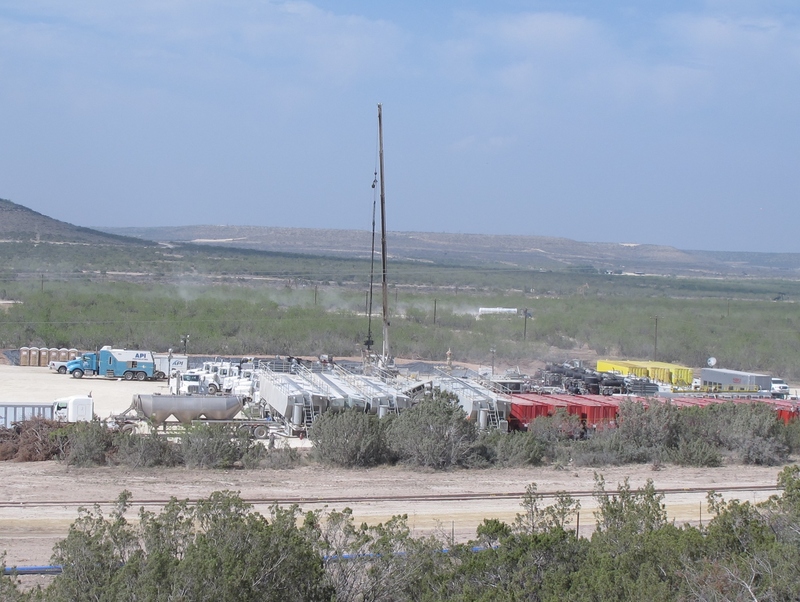 Following are charts and photos of a tour of Cline Shale exploration and operations yesterday afternoon. I remember the boom in the 50s and the late 70s. Those are minimal compared to the massive and very expensive boom taking place right now. I never imagined anything like this. For instance, there are no small operators involved. Everyone leasing, building, drilling and operating has to be a major with very deep pockets. The road you will see in the first photo cost over $1 million to build. The wells are hitting 9,000 feet in this area and much deeper in other places. Each hydraulic fracturing operation (fracking) uses more than 5 million gallons of water. 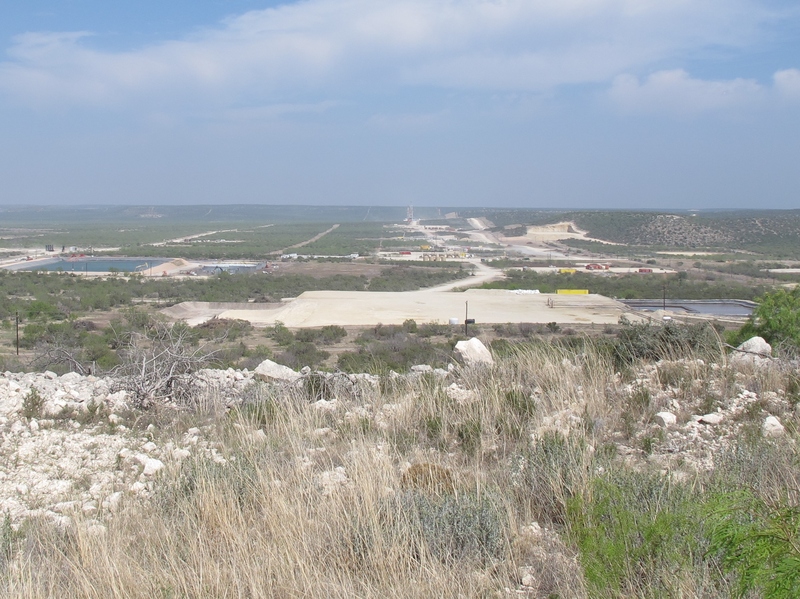 In just this area, railroad sidings have been built in Miles, San Angelo and Barnhart to unload sand and load oil. The railroad trains in San Angelo used to consist of a few dozen cars a week and now consist of 500 cars a day. And, really, this is just getting started. The Cline Shale is nearly 150 miles from north to south and nearly 60 miles from east to west. 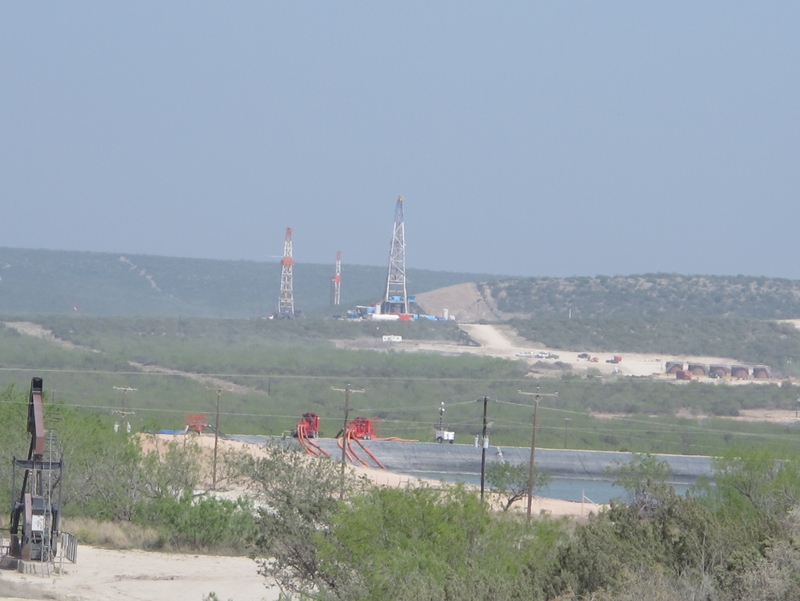 Reservoir engineers still think it will be the largest oil field ever discovered in the USA. The impact on cities and towns is profound. Colorado City has 4,200 residents and there are four hotels and two supermarkets under construction. At all times of the day and night, the traffic in Snyder seems like rush hour in Dallas. Motel rooms in many towns are being rented for 12 hour shifts. Nobody knows where people will live, how water will be available to drink or how to maintain roads that are being torn up by the heavy truck traffic. For now, everyone’s attitude is to sack the money while you can and kick the can down the road to solve problems some day. In San Angelo, one of the most important events is the rodeo. This year there were no hotel rooms for the rodeo cowboys and tourists because the rooms were full of oil field workers. That used to be the biggest tourist draw in town. I guess the cowboys slept in their horse trailers with their horses since some have very nice sleeping places. The Chamber of Commerce and the hotel owners never said a word of apology. There is a brand new apartment complex west of San Angelo with hundreds of apartments and the whole thing has been leased indefinitely to Halliburton. In Midland, restaurants are closing early because they do not have the workers to stay open and are running out of food. In Big Lake, convenience stores are closing early in the day because they are out of food and fuel. I stopped at the Dairy Queen in Big Lake and the typical order being called in was for 36 hamburger baskets to go. And there is order after order like that. Every day, people with food trailers leave San Angelo and drive to Barnhart and Big Lake to feed people. I talked to a banker in Big Lake who said the best food in town is now a food trailer. I have heard that there is such a demand for truck drivers that they are receiving $10,000 signing bonuses and making $80,000 a year. 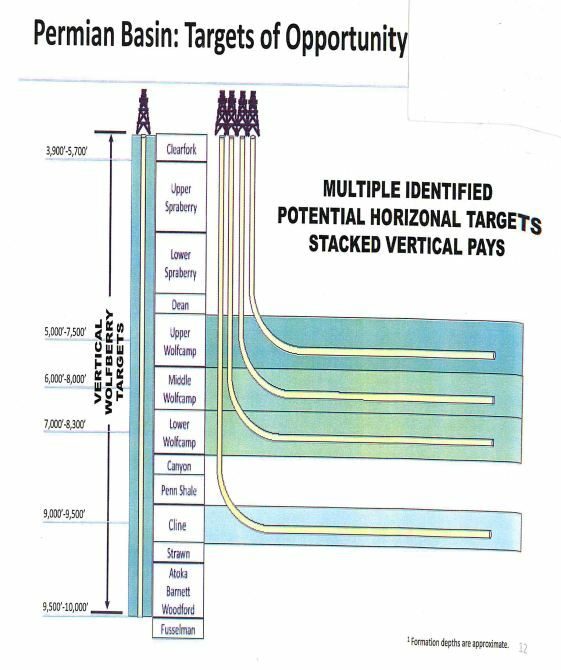 Chart of Oil Bearing Formations and Approximate Depth in Irion and Reagan Counties. The depths will vary from one part of the Permian Basin to another. 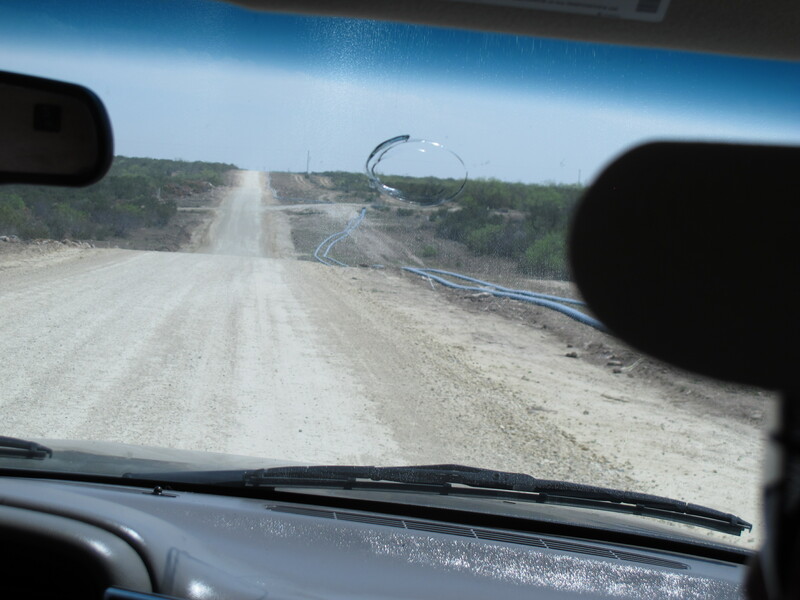 The Million Dollar Caliche Road – must be 10-15 miles long – the blue pipes are transporting water for miles from to and from holding ponds for the wells. 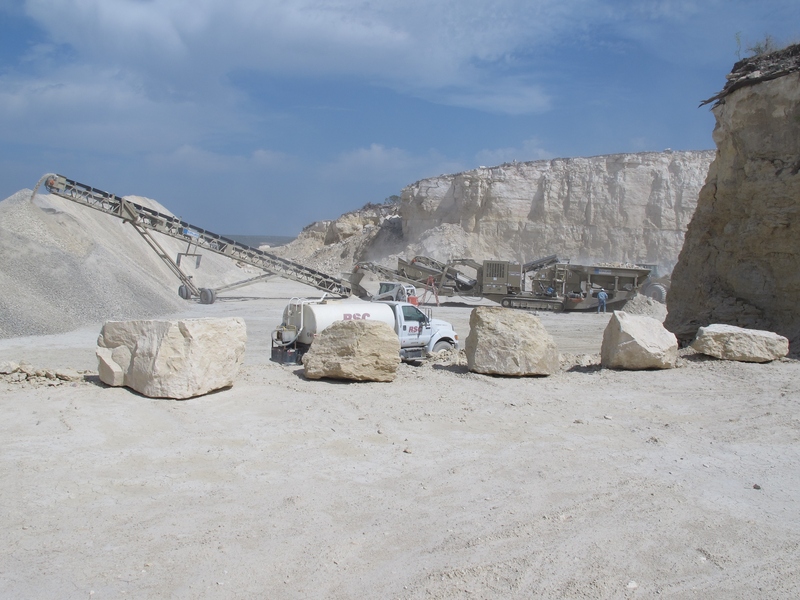 Entire hills of limestone are excavated, crushed and screened for rock to make roads and drilling pads. Look at the man standing beside the portable rock crusher. As soon as this hill is gone, then another will be crushed. The landscape is changing. On the other side of the crushed rock pile were several loaders and dump trucks which were hauling the material off almost as fast as it could be produced. Long view, about 2 miles, showing 5 pads in a row. Each pad will contain 3-4 wells. Pads are huge (several acres) to accommodate the multiple wells and the fracking operations. Three active drilling rigs. A few days ago there were five lined up. Notice the old pump jack on left. This ranch already had hundreds, if not thousands, of old wells. By old, I mean 30 years old. Notice red pumps and red pipes piping water to fracking operations. In some cases, the recovered frack fluids are being cleaned up and used for water flooding the old wells to stimulate secondary production. A fracking operation in progress. The crane holds a manifold over the drilled well. There were several heavy-walled pipes connected to the manifold, through which pass the fracking fluids, gels and propants. Each operation requires about 5,000,000 gallons of water. That’s a problem in a part of the world with very little water to start with. It’s hard to imagine the value of all the trailers, trucks, storage facilities, pumps and other equipment at each site. The cheapest thing in the photo are the porta-potties. Several wells are drilled on each pad. These are two wellheads only a few feet apart. Once the rig completes one hole, a couple of bulldozers are used to skid the rig over about 30′ where it starts another well. We saw as many as four wells per pad. 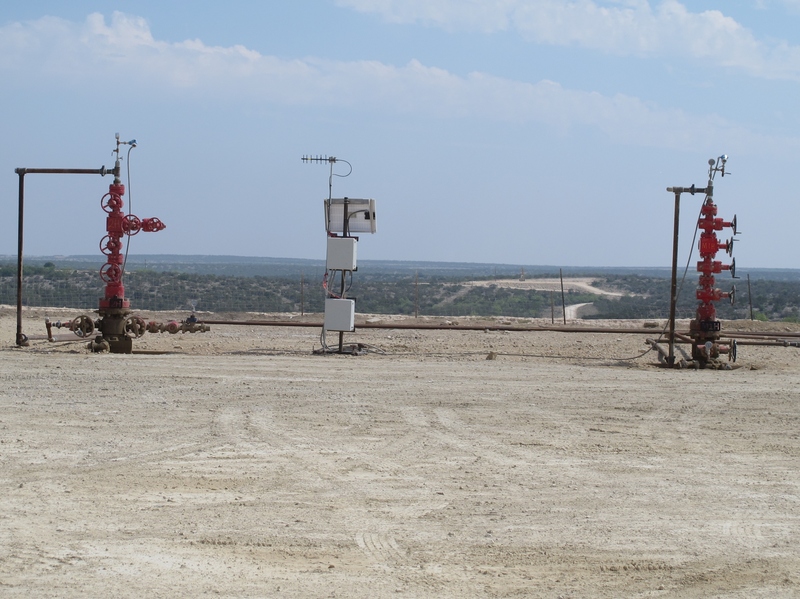 Each well probably has multiple horizontal legs 9,000 feet down in the Cline Shale. Most of the horizontal legs are 1.5 miles in horizontal length. In this particular location, all the horizontal legs are north-south because the production is better than any other orientation. This type of information is determined by drilling and testing “Science Wells” which usually cost over $2,000,000 each. These “science wells” are never meant to be produced. How can you kiss off $2 million? That’s what I mean when I say that only the big boys are playing this game. Looking at a large storage tank. There are dozens of these tanks. They are so big that you can see them with Google Earth. 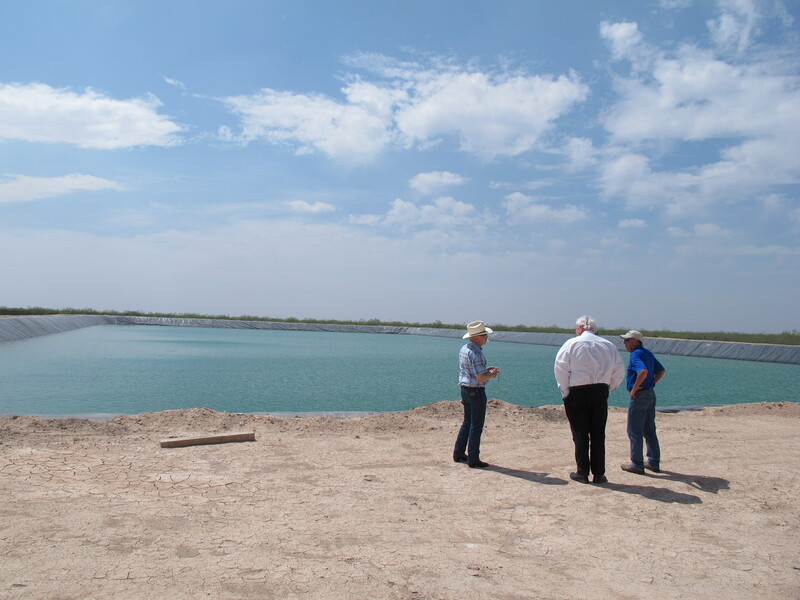 At each tank, the water surface is roughly 5 acres and the depth is approximately 15 feet. Each tank contains about 26,000,000 gallons or 624,000 barrels of water. The reason much much is stored is because the water must be readily available (guaranteed) to begin and maintain hydraulic fracturing operation.